Nothing says romance like a South of France honeymoon or romantic getaway. This truly charming part of the world makes the perfect backdrop for lingering over leisurely dinners in extraordinary restaurants, exploring picture-perfect villages and vibrant cities with surprises at every turn, and basking in the finest flavors and scents offered by the country that practically invented romance. 1) The inland region of Provence delights the eye with the pastoral views that inspired great artists like Paul Gauguin, Paul Cezanne, and Vincent van Gogh. Vineyards covered with even rows of plump grapes form a patchwork with endless fields of radiant sunflowers or fragrant lavender. Nestled throughout are picturesque medieval towns that spill over the region's hillsides, their cobblestone roads twisting and turning between imposing stone buildings that still serve as homes and shops today. 2) By contrast, the surrounding coast - the legendary Cote d'Azur, or French Riviera - is a luxurious resort area. This world-renowned playground has lured visitors for decades, inviting them to splash in the clear turquoise waters of the Mediterranean Sea, loll on its pebbly white beaches, and savor local wines or café au lait in its offbeat bistros while admiring views of yacht-filled ports. Thanks to major international airports in Nice and Marseilles, as well as convenient train service from Paris, a South of France honeymoon is easy to plan. Trains also travel throughout the region, although some out of the way villages can only be reached by car. While the region's Mediterranean climate makes it fairly temperate year-round, the best time to plan a South of France honeymoon is between May and October. Provence's famed lavender fields are in bloom from late June through July, while sunflowers turn the landscape golden in August. September is harvest season at the vineyards. Although visitors may find that English is not spoken as widely as in Paris, most waiters and other service people know enough of the language to communicate with visitors, making a South of France honeymoon relatively stress-free even for those who don't speak French. Nearly every town has its own Tourist Information office that offers maps, brochures, and personalized advice. While many American hotel chains have branches in larger towns, both Provence and the Cote d'Azur are filled with charming inns and small hotels, some hundreds of years old yet updated with modern bathrooms. Their friendly staff and cozy feeling make them the perfect hideaway during a South of France honeymoon. Nice, Cannes, St-Tropez, Cap-Ferrat and Cap d’Antibes… for decades, the picturesque seaside towns of the Mediterranean have lured the rich, the famous, and the beautiful to the French Riviera. Yet the area’s golden sunshine, clear turquoise waters, and pastel-colored bistros and hotels also make the Cote d’Azur the perfect spot for a South of France romantic getaway. The sophisticated city of Nice is the ideal starting point for a South of France jaunt. Its international airport is only a short taxi ride from the Promenade des Anglais, the frequently-photographed beachside walkway that gently curves along the coast. To the south of the wide promenade are pebbly white beaches dotted with blue umbrellas, ideal for sunning or taking a dip in the salty Mediterranean. On the north is a vibrant city crowded with lavish hotels like the glamorous hundred-year-old Hotel Negresco, lush flowers and palm trees, and small parks and scenic squares with fountains, gardens, and ponds. Explore Nice, admiring the ornate buildings with their red-tiled roofs and glowing facades in warm shades of yellow and orange. Browse in tiny shops cluttered with the floral fabrics of Provence, the sunny yellows and bright blues that capture the colors of the neighboring landscape. Another “must” of a South of France honeymoon is lingering in a sidewalk café or bistro, surveying the street life. Or stroll through the market in Old Nice, poking through the displays of antiques and bountiful local produce including figs, olives, raspberries, and melons. Add a fresh baguette from a boulangerie, some goat or ewe cheese, a bottle of local wine, and voila! You’ve got a romantic pique-nique for two. The intimate resort town of Cassis is a short drive from Marseilles. This picturesque town provides a truly romantic backdrop for a South of France getaway. Colorful cafés and restaurants line the harbor, creating a relaxed spot for watching the boats or enjoying the sunset. A small beach is conveniently located next to the port, making a dip in the Mediterranean another key ingredient in South of France romance. A high point is the scenic calanques, secret inlets reached most easily on the boats that leave the port of Cassis every half hour. Hop off to enjoy one of the small, private beaches with their turquoise water, white beaches, and dramatic cliffs. Cassis is only one of many charming beach towns that line the South of France coastline. 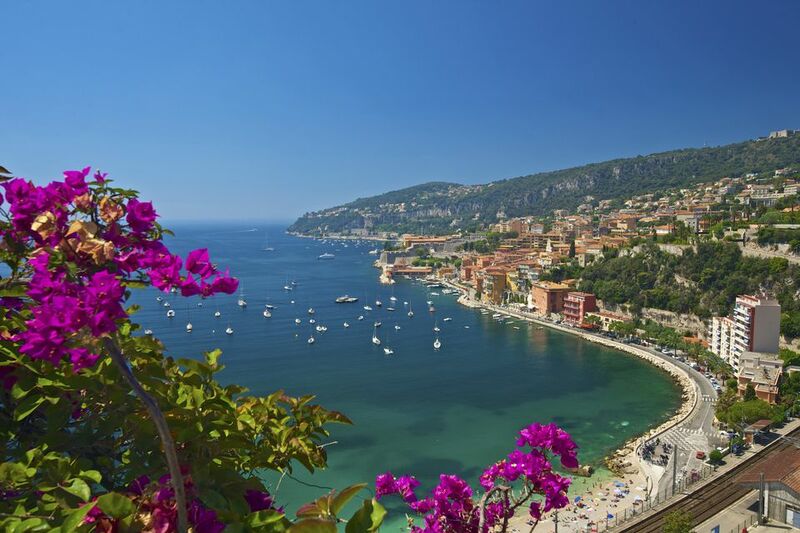 Famous spots such as Cannes and St. Tropez, as well as lesser-known hideaways such as Villefranche-sur-Mer and nearby Beaulieu-sur-Mer, all feature beautiful beaches that are perfect for sun worshipping during the day and romantic strolls in the evening. Tiny hotels, often decorated in warm shades of yellow and rust, create a feeling that the two of you really are the only people in the world. The ultimate Cote d’Azur destination is Monaco. This tiny, bustling, cosmopolitan country, which hosts the famous Grand Prix auto race every May, also boasts sophisticated restaurants, clubs, and of course the famous casinos of Monte Carlo, Monaco’s capital. The famed Monte Carlo Casino, housed in a lavish 18th-century building, has long been a favorite with the Beautiful People. Other casinos provide a more Las Vegas-style experience. Touring the palace that Princess Grace and Prince Rainier once called home is another experience that’s not to be missed. Few things are as romantic as enjoying new experiences together, and that includes discovering new sights. A South of France vacation can be made even more memorable through visits to historic spots and cultural sites. Plan on stopping at medieval towns that dot the countryside of Provence. These charming villages, with centuries-old stone buildings crowded along curving cobblestone walkways, are still lively centers for residents and shopkeepers, making them fun to explore hand-in-hand. Many are small, like the picturesque village of Eze, a short drive from Nice. Winding your way through the narrow streets brings you to the Jardin Exotique, where 360-degrees of breathtaking views await. Les Baux also looks as if it sprang from the pages of a storybook. At the top of a hill, visitors can tromp through the remains of a medieval castle and watch a film on Van Gogh, Gauguin, and Cezanne, who so magnificently captured the surrounding countryside on canvas. Vaison la Romaine offers another chance to step back in time to the Middle Ages, weaving along cobblestone walkways to discover tiny public squares and picture-perfect fountains. Meanwhile, the austere stone buildings of monasteries like the Abbey of Thoronet demonstrate the simple lifestyle of medieval monks. Perhaps the best-known medieval walled city is Avignon. During the 14th century, Avignon was the home of seven popes, and the huge stone Palace of the Popes still stands. This awe-inspiring structure aside, Avignon is a lively city packed with shops, cafés, and a colorful indoor market, Les Halles, with a delectable selection of cheeses, breads, fish, and fresh produce. A South of France vacation tempts couples to step even further back in time. More than 2,000 years ago, the Romans ruled this region, and ruins of their amazingly advanced civilization are still on display. Nimes is the home of a tremendous arena built around 100 A.D. and used for spectacles. Vaison la Romaine contains the remains of what were two luxurious residences during Roman times, as well as the ruins of a theater. The town also features a fascinating antiquities museum. Orange also has the remains of a Roman theater, along with an imposing arch. The Pont du Gard, a gigantic aqueduct built by the Romans, originally stretched 30 miles. Today, its tremendous size and somewhat quirky museum – one that focuses on the history of water and plumbing – make it a popular destination for locals as well as tourists. Many fine artists found inspiration in the beauty of Provence and the Cote d’Azur. The region is home to three art museums, each one a tribute to a genius who created some of his most impressive work in the area. In addition to a port filled with luxurious yachts, the seaside city of Antibes is home to the Picasso Museum. Picasso lived in the building — a castle, the Chateau Grimaldi — in 1946. Today the museum houses his work along with exhibitions by other noted artists. The blue waters of the Mediterranean serve as a breathtaking backdrop for Picasso's sculptures outdoors. The Chagall Museum in Nice contains an impressive collection of the artist’s paintings. The Matisse Museum, also in Nice, contains the well-loved Fauve's paintings and sculptures. Next door is a Franciscan monastery with scenic gardens that offer a perfect spot for a romantic picnic for two, as well as unparalleled views of the city. Matisse’s artistry is also celebrated at the white-walled Chapel of the Rosary in Vence, which he designed to thank the Dominican sister who served as his nurse. His distinctive style is seen in the building’s stained-glass windows. While no actual van Gogh museum exists in the South of France, the tormented artist covered hundreds of canvases in Arles, where the gardens he painted have been recreated and easels have been set up around the quaint medieval town to show where he stood while he made some of his best-known works. Van Gogh also lived in St. Remy-de-Provence, known for its two Renaissance chateaux. St. Remy’s Centre d’Art Presence Vincent Van Gogh contains documents from his life, as well as a film about the great but tormented artist. Other towns also feature museums that provide a peek into the local culture. In Grasse, the world’s perfume center, visitors can learn how perfume is made at Fragonard Parfumeur, while a museum dedicated to lavender, Musée de Lavande in St-Remese, contains old tools used to create perfume and a botanical garden. Isle sur la Sorge has a small Antique Toy and Doll Museum. There’s even a shoe museum, Musée International de la Chaussure in Romans, which covers the artistic and practical aspects of footwear throughout history. A trip to Provence and the Cote D’Azur in the South of France provides an unparalleled opportunity for indulging the senses, as France has mastered the arts of fine fragrance, fine wine, and, of course, fine food. Since this region is the perfume capital of the world, every South of France trip should include a stop in Grasse, the home of two perfume factories. Parfumerie Fragonard offers tours that demonstrate the magical process by which flowers are turned into perfume, soaps, and other scented products. The building also houses a museum with antique labels and other related items. Parfumerie Molinard also explains the techniques used in perfume production and includes a collection of rare perfume bottles. Even without stopping at an actual perfume factory, visitors can enjoy the fields of fragrant lavender that stretch as far as the eye can see from about the last week of June through July. The sights that surround visitors at every turn are also a highlight of a South of France trip. Driving along a country road is like taking a step back to the 1800’s. Farms and vineyards flank the road, dotted by quaint stone farmhouses. The Camargue, nicknamed the Everglades of France, is a swampy area that gives free reign to white horses that gather around ponds and streams by the dozen, bulls that are used in local bullfights, and flocks of colorful flamingos. The Gorges du Verdon, meanwhile, is considered the Grand Canyon of France, offering views of dramatic cliffs and rushing blue-green waters. When it comes to the good life, France is known throughout the world for its dedication to food. And because of its proximity to Italy, this region has been widely influenced by Italian cuisine. Pasta is a specialty, often served with the basil and pine nut sauce called pistou, or pesto. Gelato in a dizzying number of flavors is available even in small towns. The olives that grow in abundance are made into delightful tapenades. The area also produces sweet tomatoes, figs, and honey in a variety of flavors, including lavender-infused honey. Many towns offer regional specialties, like the salade nicoise of Nice, heaven for anchovy lovers. Then there are all the typical foods the French are famous for, including croissants, brioches, and elaborate pastries that truly taste as good as they look. Every South of France trip should also include a visit to a winery. Vineyards sprawl across the land, producing some of the world’s best wines – at some of the world’s lowest prices. Chateauneuf du Pape has the highest alcohol content of any French wine, and there’s even a town of that name that’s crowded with boutiques selling Chateauneuf du Pape wines made by the small individual wineries throughout the region. Meanwhile, Cassis is known for its own local white wines. The region also produces two popular aperitifs: almond-flavored amandine and anise-flavored pastis. One of the best places to become immersed in the scents, flavors, sights, and sounds of the region during a South of France honeymoon is the outdoor markets. Many towns hold them on different days of the week so that it’s almost always possible to find one. Beginning early in the morning, local cheesemakers, bakers, farmers, and merchants set up shop under colorful awnings, laying out a mind-boggling array of fruits, vegetables, sausages, fish, cheeses, soaps, fabrics, and flowers. The countryside isn’t the only place to enjoy extraordinary gastronomic experiences during a South of France trip. The French are famous for their passion for eating, and nearly every restaurant, from casual bistros to the best-known four-star restaurants, reflects the country’s deep respect for food. Or stop in at a small grocery store — like the ubiquitous Casino chain — and browse the shelves for unusual sausages, cheeses, and other local specialties. Chances are, you’ll treat your senses to a brand new texture or taste, creating just one more memorable experience during your trip to the South of France.